Woodpassage | Woodpassage – From tree to house! A tree grows in the forest – wood comes from the tree – and the wood becomes a house. The wooden “woodpassage” sculpture placed outdoors in the centre of Europe exemplifies this process. With simple pictographic symbols over forty stages, it conveys the transformation from fir to house. This conversion is shown as cuts out of large blocks of wood, cut by cut. 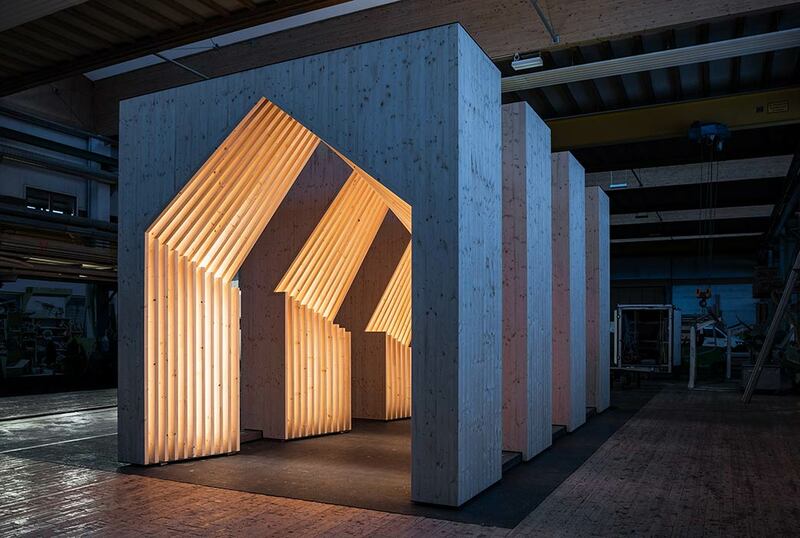 The result is a sensory experience; consisting of four wooden gates, 4.32 m wide, 4.32 m high and 8.65 m long, the “woodpassage” expresses a strong three-dimensional message when viewed from afar. Whilst strolling through the cheerfully illuminated passage, it becomes playful ambassador for the ecological advantages of timber construction. About 13 cubic meters of wood were needed for the construction of these 4 gates. This amount grows back in Europe’s forests in 1/2 a second. Furthermore about 13 tons of CO2 are permanently bound in the wood of these 4 gates. This corresponds to the pollutant emissions of a passenger car over 8 years.